To end the week on a lighter note I thought it would be nice to let you know about one of the most beautiful festivals to take place in Thailand, the Chiang Mai Flower Festival. The 33rd annual Chiang Mai Flower Festival will take place February 6th through February 8th in Suan Buak Hart Park, in the old city surrounded by historic moats. With the natural beauty of Chiang Mai as it’s backdrop the annual flower festival is a major draw for thousands of residents and tourists alike. Held during the first week of February the festival has a little bit of something for everyone and a lot of beautiful flowers. The festival takes place during the cool time of the year in Thailand when all the flowers are in full bloom and the city will be awash in vibrant colors and scents. Throughout the 3 day festival visitors will see an amazing array of beautiful flowers on display, including over 100 varieties of orchids and miniature trees. The second day of the festival kicks off with a parade through the town featuring huge floats covered in a tapestry of amazing flowers numbering in the thousands. You’ll see Thai performers in traditional Thai dress adorned with flowers as well as hill tribe performers in traditional dress. As the day draws to an end everyone will head to Suan Buak Hart park where all the floats, award winning flower growers and landscapers projects will be on display. The park will be full of food stalls selling their delicacies and later in the afternoon the Miss Chiang Mai Flower festival beauty pageant starts. The party goes well into the evening until the new Flower Festival Queen is chosen. This is really a must see event, especially for the photographers among you. I must admit that this sounds fantastic-I love flowers. Unfortunately its rather a long way to travel. I suspect they also have similar events further south-perhaps you know of some? Mikes last blog post..New Orchids for my Thai Garden. I haven’t heard of any others. 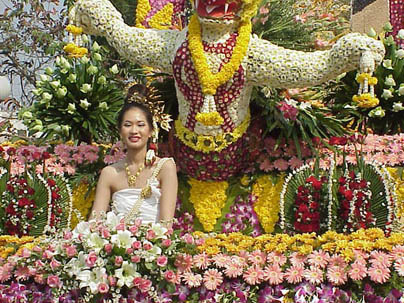 The Chiang Mai flower festival is the only one that I have heard of. Phu Rua, it’s not a lot further south, in fact around 520 clicks from Bangkok. Every year around December 28th Phu Rua in Loei Province holds an annual Flower Festival which lasts around six days. I have been there twice before but would guess the Chiang Mai Festival is a much larger event. Quite a hike from Hua Hin but nonetheless a little bit closer.